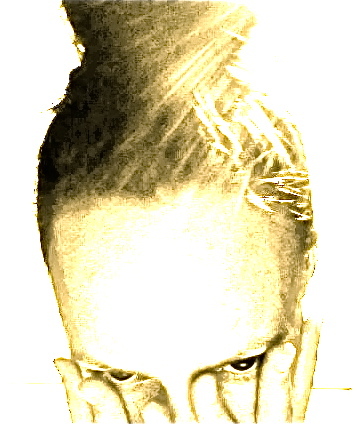 I had a massive bun . . .
. . . but I chopped it in order to lighten my head. All that hair was a frenzied mad mass of paradoxical anxieties, half-baked hypotheses, edited-but-not-gone ramblings, and the ghosts of essays past. As one friend said: That is where your paper lives, when you are not writing. Yes. Not going to lie, some days I miss the beautiful mad bun, and I could put it to good use in new ways now. * But it was time for a change that signified clearing, space-making, clarity, to focus on the last stretch leading to my MA defense. A strangely long journey, the revision process. And then it was over, with mixed results. The final draft felt too short, too undeveloped, and too full of content at the same time. It felt like three papers, like an outline, or a starting place. I overthought all the thoughts, did too much, reworked the paper nearly out of existence. Like my entire MA, the paper was process-oriented more than it was outcome-oriented. I went into the defense with relief that it was suddenly happening, with confidence and lightheartedness due to a nice connection with my (glowing) supervisor the day before, and with a lot of energy. Energy: nervous, buzzy, hilarious, freaky, excited. I have this feeling that some people, academic-like, find it uncool or immature to feel this way before something like a defense. Irony, after all, is the daily gruel. But nervous energy is the same as stage fright–it is excitement, anticipation. With music, I had that feeling before each show. With yoga, I have it before teaching each class. I love to be in front of an audience–whether stage, podium, or classroom. Sensitivity, nervous energy, over-analysis, obsessiveness, perfectionism, thin skin, emotion–all of that is what makes it good. Sure, I want to impress you. I want you to like me and approve, and be comfortable, and be proud. And I want to entertain you and involve you, and to do something with the visceral quality of the proximity between you and I; when there are many of you, that quality is even more vibrant, lively, intimate, and exciting. I will take it all personally. Two things happened the day before the defense. The first was that I met with my supervisor, and while wrapping up, I asked in general what makes a successful defense. She rephrased the question as a statement about what makes a joyful defense. The shift from “successful” to “joyful” repositioned me from my head to my heart, and joyful became the operative word. The second thing was that newcat Ziggy, our recently adopted thirdcat, brought home a snake. I heard a great commotion upstairs as I was fussing with putting images onto PowerPoint slides. This was a truly great commotion. Loud, rapid, staccato. I was on the edge of my seat and about to go look for at least an hour. But aspect ratios, borders, centering, saving, ordering, repositioning, and all the rest kept my focus while all the racket went on. Eventually the thuds and slides and toppling attacks above subsided, and I kept working. Later I got up to call a friend for her birthday. I talked on the phone, walked around, went up and down the hall. Newcat was crashed on the bed with her chin out, faceplant pooped and extra floofy. I murmured at her self-satisfied beauty, went back through the hall to the kitchen for whatever it was, and doubled back to go down the stairs when in the corner of my eye I saw a shoelace on the hallway floor, which was odd because it had not been there a few seconds before. Shoelace? Nope. Whether you are partial to the fun fact that there is a post called, “FAQ: The “Snake Fight” Portion of Your Thesis Defense” on McSweeney’s, or to symbolic interpretations of snakes such as transmutation, creative energy, rebirth, or healing, the main thing for me about finding a snake in my hallway was THE FACT THAT IT HAPPENED. My phobia and I have agreed to perceive the event as a facing of fear; whatever else it means, including nothing, is also welcome. In the end it all contributes to the joyful feeling I have about completion, about the defense, and about the opportunity I have now to start something new. All this nostalgia I have felt over summer for music, past loves, former friends, old houses, my guitar, my old songs, backward bending, freedom, free expression, free movement–all is desire to connect with these things now. The past DOES matter when memories and dreams thud your heart, and wake you up suddenly. Vision, phobia, fear, excitement, the un-ironic nerdy joy of exposing my mind that is both wise and wishful, all of it is waking me up, calling me into being. This entry was posted in nomenclature and tagged change, creativity, dance, graduate studies, occupy your awkward heart, writing process. Bookmark the permalink. 2 Responses to I had a massive bun . . . This is one of my favorite posts! There is something beautifully satisfying about completion of a project. And of course, facing a fear and feeling a sense of accomplishment in that regard is also satisfying. What a wonderful time of your life right now… a shift to creating something new! Thank you! I was reading that post over again and I realized that I wrote nothing about how fabulous the defense was. A joy and a success both, for me. And the committee was happy too. On to what comes next!